Using an high end Android device sounds good, but what's more important is to secure your device with some useful android apps available free of cost. Usually free software security apps give limited period of usage, but at the same time you can get yourself a premium pack for secure your device lifelong. There are many secure ways to get your phone back if you are an iPhone user or a Windows phone owner, but Android OS might not have the effective way to deal with the problem. What's more crazy, many people even don't know about such security concepts developed for their device. Statistics say that about 75 percent of iPhone users, 57 percent of Windows phone users and only 35 percent of Android users are having a quick general idea of getting back their devices, using apps and security settings. With the increasing Android owners growing every month, tracking your android phone is a must thought that each should bear in mind. So we have noted down few quick ways to ensure that your android phone reaches you safely from others hands. There are few apps that allow you to track your lost android phone, and we have listed some important ones here. There are many security software that offer the same at an affordable cost, however many of those are free for beginners to use it for a specific time frame. 1. Google's Android Device Manager: Google will be releasing this service next month following the giant success of iPhone and Microsoft who have already developed security systems for their phones. Many android users weren't having a flexible system to track live location and wipe out the data with just a click, but now this integrated service will feature both, thanks to Google for developing it after couple of years of time. This service will be available for all Android phone users without needing it to download. This service will be available to all android users of operating system 2.2 and above. According to reliable sources, this service will ring your phone to the highest volume alerting about the presence of it. If your phone has got stolen, then you will basically need to track it live on the map, and moreover you will also hold the option to wipe the data out immediately to avoid leaking out secure information from your phone. This will be Google's first flagship security service after three years of developing the Android OS and implementing to it. 2. AntiDroidTheft: This is a very useful application that works to track your android devices using its build in tracking feature. All you need to do is download the particular application from here: AntiDroidTheft official app. Suppose someone has stolen your android smartphone, this application will enable you to know the latest location of the phone using your phone's web browser. 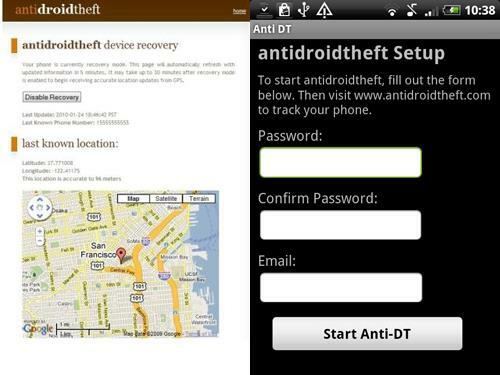 You can track your phone live from the homepage of AntiDroidTheft from your PC. Even worse, if someone changes your phone's sim card you will immediately receive an email alerting you the same. So keep your phone safe by downloading this must have app. 3. Kaspersky Mobile Theft Security: This particular software is not only a life saver when your phone is stolen or lost, but also keeps you reliably safe in time of hacks, virus attacks and corrupt files while downloading. You will need to buy the version of Kaspersky security system for your android smartphone before you can use it. This software is extremely useful and documented with device tracking facilities like GPS, Google maps location finder and Wi-Fi. You can also use this software when you want to block unwanted calls and messages you receive unknowingly. Added features like keeping your personal information secret while sharing your device with friends and colleagues makes it popular among many security services. This software costs around $5.00 with product license key. 4. 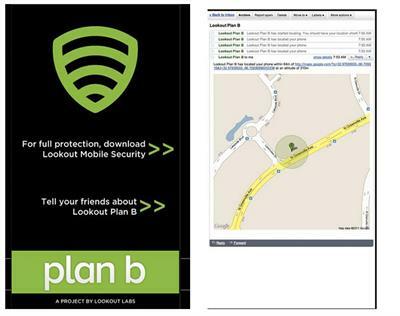 Plan B App: This app is extremely useful in those circumstances when you haven't downloaded any tracking or recovery app, not even the Plan B. In such circumstances, you can visit the official website of Plan B to set your details and track immediately the location through GPS system. This particular app monitors your phone's cell towers and GPS to get the information back to you through email alert. It will deliver you the address every 10 minutes to your Gmail address; therefore you remain informed about the current location. In case your android smartphone doesn't support GPS, it will send you the information to your friend's mobile number from where you have checked in. Therefore tracking becomes simple and convenient as well faster for you. 5. 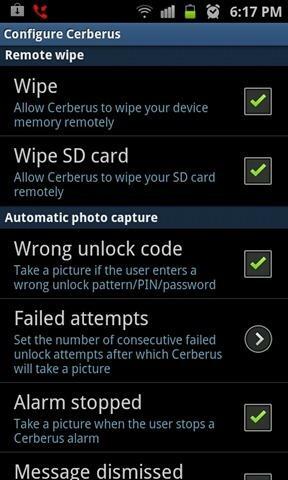 Cerberus Security service: With Cerberus, not only you are involved in finding your android phone, but also involve in smartly tracking down the phone along with the thief who is holding your device. Firstly as soon as you send the signal by inputting the required data at your PC from home, alarm starts triggering to the loudest tone with blinking display which sets up the difficulty for the thief. It also gets automatically locked up, so the phone goes useless for the thief even if he keeps it lifelong. It tracks down the status of your phone's location through GPS and gets you the data every 5 minutes. On one click, you can order to wipe out all the personal details stored in your memory card, internal storage of your smartphone. So it keeps your phone away from hacking information that is personal to you & your family. It will immediately send you email alert while sim card is being changed. So you get all the security measures on one go. Even if you retrieve your phone, you can only open it after disabling the utilities you logged from your PC. It's that ultra safe! Since this app service is of high demand these days, its free version has been limited to one week only. You will need to buy the Pro version to get things working for you all the time. What's more you will get the synchronisation and service for 5 devices simultaneously when you buy it, so you can share with your friends too!